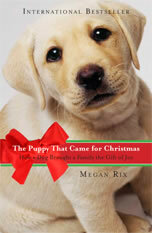 Published November 2010 in the UK, Megan’s memoir, “The Puppy That Came For Christmas…” quickly became a Sunday Times Best-Seller; It has since been published in Portugese, American and Slovakian editions. [quote]When Megan and Ian got married, they wanted to start a family. But their desire to be parents ended up bringing one furry bundle of fun after another into their lives. At the same time as embarking on difficult and traumatic fertility treatment, Megan and Ian became involved with a charity which provides helper dogs to people with disabilities. 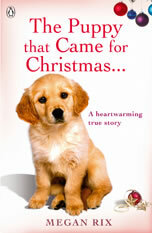 And into their home one day came Emma, a soft, sweet-natured puppy with whom they fell instantly in love.